Can anyone tell me what chord Bach notated in the second half of measure 91 in the score below? I can see that the first chord in this measure is FMaj7, which is the end of a circle of fifths chord progression from the previous measure (90)...and the chord in question is used as a function for modulating to a new key of A Minor (92 and 93 consist of E7 and A Minor, 94 is in the new key of A Minor). 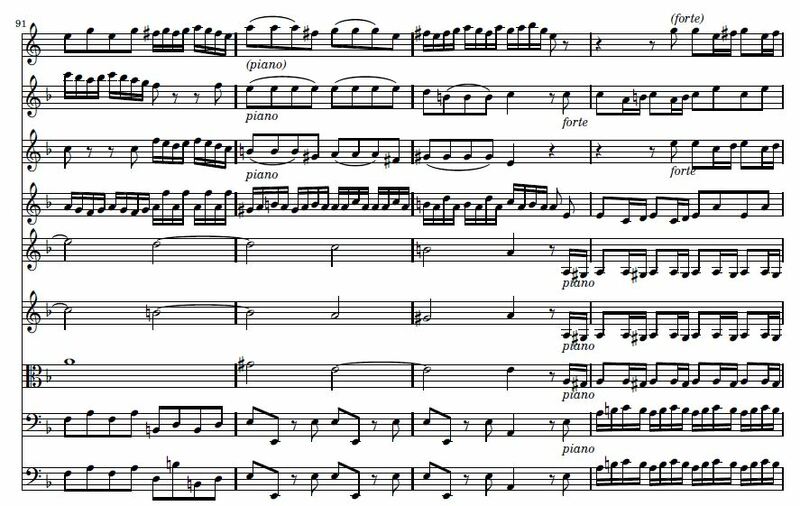 The Chord in question seems mainly based on D and B, with viola playing a whole note of A, some F's on flute, oboe and violin, and some C's on Trumpet, but I'm not sure which notes are chromatic and what is the main chord notated here. Since we're moving from a VI chord in A minor (first half of m. 91) to a V chord (first half of m. 92), standard practice suggests that the second half of m. 91 will be a chord that smoothly connects VI to V. Without even looking at a score, my guess is that the chord will be either a subdominant or supertonic of some type. Looking at the score, the B in the bass strongly suggests a supertonic chord. Looking above it, we have B D F A, which pretty clearly lays out a Bø7 chord. With D in the bass, we're looking at Bø6/5. The Cs in the trumpet are non-chord tones, either passing or neighbor depending on the circumstance. The same is true of the Es and Cs in the oboe. Notice, then, that the circle-of-fifths progression that led into m. 91 continues, because F goes down a fifth to B, which goes down a fifth to E, which will ultimately go down a fifth to A.
there is no F Maj7 in measure 91, and the f# on the last 8th note of measure 92 is the augmented 6th of the melodic monor scale. Not the answer you're looking for? Browse other questions tagged notation chord-theory classical-music j-s-bach or ask your own question. What does the roman numeral notation mean for this borrowed chord? Relation of the diminished chord to the circle of fifths? Complex chords: does the construction depend on scale degree?